This bed, inspired by history and techniques, is a product which started off as a structure and turned into a concept: to make a bed with the same attention, the same methods, the same materials and the same tools used right up until the last century. Made by hand from heavy oak and nished with pure linseed oil mixed with natural pigment Plinio is a unique bed which is all-natural and specially designed for those who suffer from allergies. Four large turned screws enable the bed to be assembled, taken apart and cleaned in every nook and cranny with the utmost ease – unlike any other bed you can buy today. 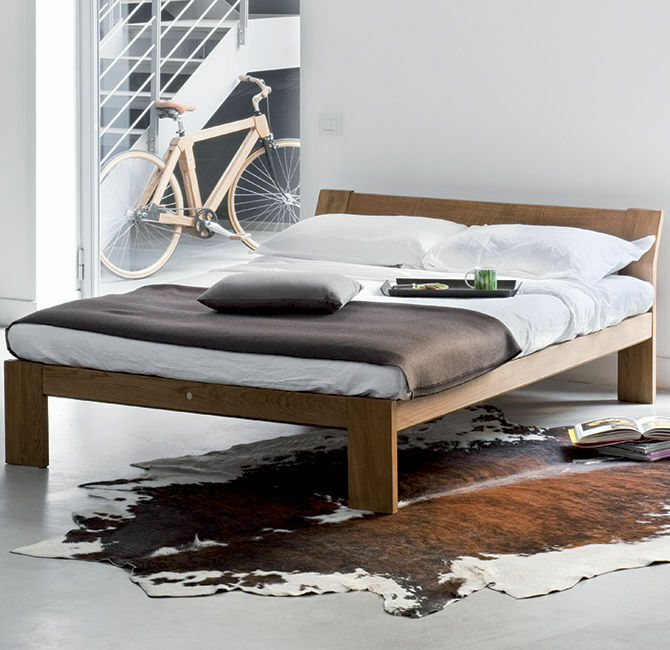 The structure, which is made up of a network of beech slats, means that air can circulate easily and it functions well with the Plinio mattress. This type of structure does not only improve the quality of sleep but also makes cleaning it super easy. Pure linseed oil is used to treat the wood, to enhance the grain but also to make it water repellent as well as improve the gloss and generally prolong the life of the product.